Golfboarding at Colorado’s Grand Elk Golf Club! Up to now, you could walk or take a cart to play Granby, Colorado’s Grand Elk Golf Club. 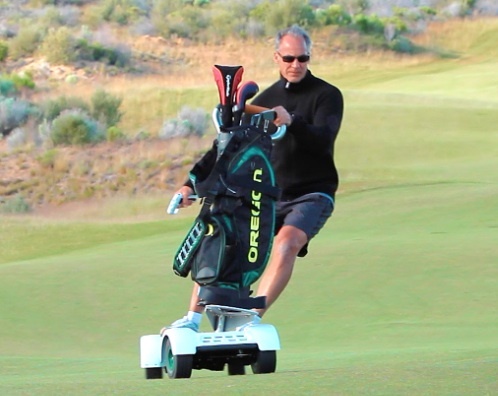 Now you can traverse (or surf it) in sporting style on the Golfboard. This is a battery-powered stand-up, personal mode of transportation somewhat akin to surfing or snowboarding the golf course on its four tiny wheels. This is earth-surfing at its finest on a 125-lb. base that can travel between 5-10 miles per hour and cover 18 holes in a single battery charge. The unit also holds a golf bag with a set of clubs. Grand Elk is one of more than 250 golf courses worldwide to offer the Golfboard. For more information on playing or ‘surfing the earth” with a Golfboard at the Grand Elk Golf Club, contact Mike Ritter at 970-887-9122 or email him at mritter@grandelk.com. And check out the Golfboard at www.golfboard.com.